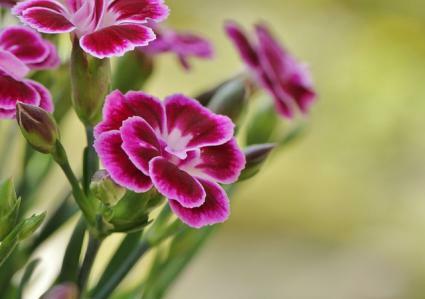 Carnations (Dianthus caryophyllus) are also called clove pinks because of their deliciously spicy clove-like fragrance. They are one of the all-time most popular cut flowers, long used for bouquets and corsages, and are easy to grow at home. Carnations need at least four to six hours of direct sun each day and well-drained soil. They are herbaceous perennials with low, bluish-green foliage and flower stalks that extend 12 to 18 inches above the leaves. Carnations come in almost every color of the rainbow and are primarily used in masses as a bedding plant, as potted specimens or as edging along a path or in front of a taller perennial border. Often grown from seed, carnations are typically started indoors in early spring. They germinate readily, though a source of bottom heat will speed up the process. When the seedlings are four to five inches tall, they're ready to put into pots or into a well-prepared bed. 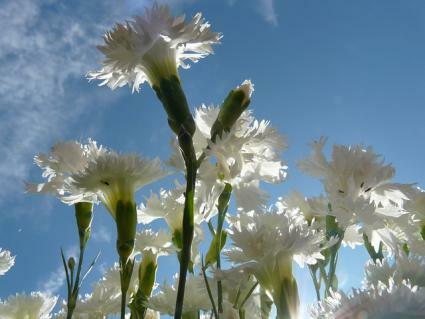 Carnations should be watered and fertilized regularly for best flower production. Water once per week if there has not been rain and fertilize monthly with a diluted all-purpose fertilizer. The foliage is so low to the ground that it's best to avoid mulching, which can lead to leaf infections in carnations. Remove spent flowers periodically to encourage repeat blooming and cut the stalks down to the height of the basal leaves once they have finished flowering for the year. Tall varieties with large flowers typically need staking to prevent them from flopping over in the wind. Carnations are susceptible to long list of diseases, most of which appear as some form of discoloration or deformation of the leaves. They are hard to treat without the use of harsh fungicides, making prevention to the best form of treatment available to home growers. To start with, look for disease resistant varieties - this information is usually found on the seed package or nursery label. Second, avoid excess humidity and take steps to ensure good air circulation. 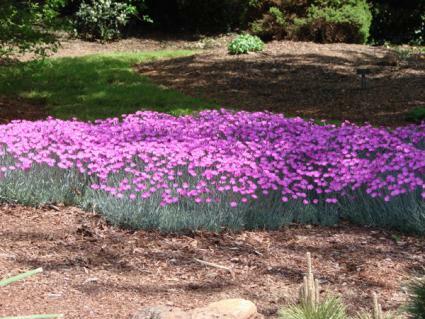 Crowded plants are much more susceptible, making it important to thin out beds of carnations every two to three years. Also, water in the morning so the plant has the chance to dry out during the day and use a soaker or drip system to prevent wetting the foliage. Chabaud carnations are extra large with ruffly flowers on extra long stems up to 24 inches; they come in many colors and are the best for bouquets. Dwarf varieties produce compact plants with several flowers on each stalk; these are often in basic colors like white and red and are some of the best varieties for border plantings. Spray types are extra small, featuring stems with numerous miniature carnation flowers; they come in many colors and are good for corsages. They are part of Biblical lore as the flowers that grew from Mary's tears at the crucifixion of Jesus. The founder of Mother's Day chose carnations as a symbol for the holiday, a tradition which continues to this day. In general, carnations are given as a sign of love and infatuation. Depending on the color, many other sentiments are associated with carnations - luck (white), red (admiration), and yellow (disappointment). Carnation enthusiasts have formed organizations all over the world to share seed and growing information on the hundreds of specialized varieties. Even if you're a novice, these groups are a great source of information on the best growing practices.